Our research group focuses on understanding the physics of soft condensed matter. This is a huge and exciting field in modern science which involves different systems such as liquids, liquid crystals, colloids and polymers. These systems play a paramount role in nature and modern technology. 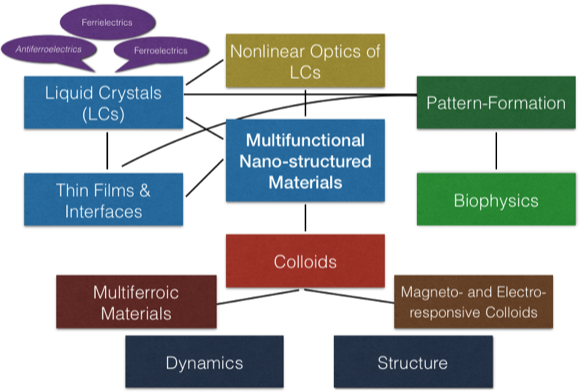 Using various experimental techniques, we explore physical properties of soft and biological matter and investigate the way to design novel multifunctional and nano-structural materials. The research in our group combines areas such as physics, chemistry, biology and applied mathematics. We collaborate broadly with scientists from all over the world. On this website you will find detailed information on ongoing research projects as well as offered courses and study programs. Students of physics and bio-system technology are welcome to take part in our research and conduct their pre-diploma (Forschungsbeleg) and diploma projects in our lab. Gusav Jäger aus Werner-von-Siemens Gymnasium is making his MINT research on Active Matter in our Lab! Lucas Scharbrodt joined our team. Exam "Classical Physics": 15.02.2019, G05-210. Only calculators are pemitted. Our new paper on NTB droplets have been accepted in Langmuir! Tina Reuter has joined our team and will be working on the dynamics of ferrogels.